ThinkFest 2017 continues this Sunday [Oct 15] with ‘Set Us Free, Bermudians during the Humanitarian Revolution’, a talk by Clarence Maxwell, PhD. Dr Maxwell’s presentation will outline how Bermudians contributed to the end of slavery debates as well as the demands for equality. 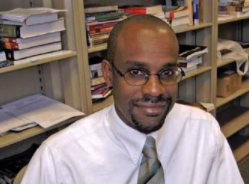 Presently assistant professor of Caribbean and Latin American History at Millersville University in Lancaster, Pennsylvania, USA, Dr Maxwell specialises in topics concerning Bermuda, the Caribbean and Latin American, the African Diaspora, and the history of Atlantic enslavement. Dr Maxwell said: “The push for abolition and the push for the removal of race-based civil and political disabilities will form this discussion of political activism in Bermuda during the early nineteenth century. “It will begin with the historical context: legislative-political and social-demographic situation of the last 70 years of slavery in Bermuda. It will shift to the effect the ‘French Revolution in Saint-Domingue’ had on Bermudian elite opinion. ThinkFest is Bermuda’s first seminar series featuring an all Bermudian cast of outstanding academics and independent thinkers. Each of the ThinkFest presenters dive deeply into a single topic for an extended period, followed by a chat with a host and audience Q and A. For ThinkFest 2017, more than a dozen academics have been invited to present on topics such as the latest developments in cancer research, linguistics, media and race, ethnobotany and crime talk. Tickets for ThinkFest 2017 events can be purchased online at think.bm or at the door. Early bird, youth and group discount tickets are available.